Americans waste 50% more food today than we did in the 1970s. You can support our Zero Hunger | Zero Waste social impact plan by reducing food waste at home. Check out these tips from our team of food waste experts. According to the National Resources Defense Council, Americans waste 50% more food today than we did in the 1970s. And all that food we carelessly throw away, releases dangerous greenhouse gasses – a major contributor to climate change – as it breaks down in landfills. The good news? Each of us can do our part to reduce climate change, simply by doing a better job of properly storing and transforming all the food we buy (tip to tail) into delicious meals. 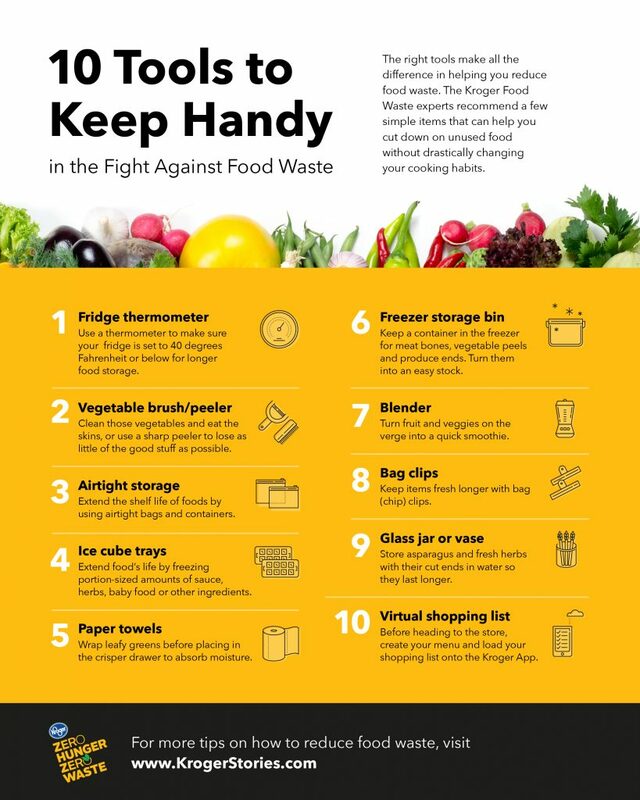 Our team of Food Waste Experts at Kroger recommend these ten tools to help reduce household food waste, so you can join us in our Zero Hunger | Zero Waste social impact plan.